Well here we are 5 months into the next console war. Although it is not yet clear who will be the victor of this fierce next gen battle, we can start to see a picture emerging. The PS3 did not do as well as one would have thought. Being plagued by a lack of stock during the crucial holiday season; cost Sony dearly. Many Graphic hungry gamers turned to the readily available 360. Being the highest priced of the three didn’t help Sony much either. The good news is that BluRay has taken an early lead in the next gen DVD struggle. So don’t count The PS3 out just yet. The Wii seems to be clearly “Wii-ning”. It’s hard to find a Wii available at any store, and when they are in stock they are usually gone within hours. Hell! There are still lineups before store openings when expected Wii shipments are due. The 360 jumped out the gates early 2 holiday seasons ago. It took a noticeable lead after this past holiday because of stock on hand and a decent sized game library. Yes a picture is starting to form, almost half a year in and things are progressing as FFOmake expected. That is until Microsoft threw a monkey wrench into the mix. Rumors had been flying around the Web for months that Microsoft was planning to release a new 360 package. A new 360 with an HDMI output they claimed. A 360 with a bigger hard drive they boasted. Eventually these rumors leaked into the industry. Soon enough, pictures of a black 360 surfaced in an issue of Game Informer, and then it was so. 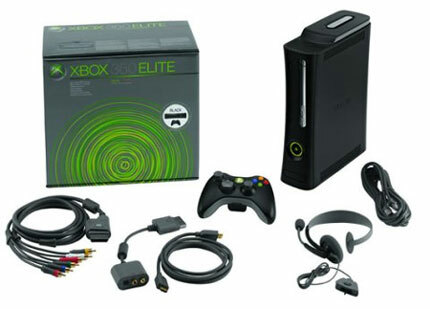 Microsoft recently announced that the XBOX 360 elite would be hitting store shelves sooner than one would have thought. A sleek Black 360 with an HDMI output, an HDMI cable, and a 120gig HD! The price for the Unit is set at $479.99 US. It does make sense that Microsoft would do this. Their aggressive online Xbox live strategy seemed just too big for the measly 20gig HD originally supplied. With HD movies and TV content readily available for download these days, how could 20gigs suffice? Many Sony and Nintendo-philes will probably cry out, “so what? It’s just the same damn system with a bigger HD!” Well to that I say, Its all in the marketing my friend! The Nintendo DS practically reinvented itself over the holiday season with the DS lites. There is no reason that Microsoft cannot do the same. Also, Game stop has just recently announced a new “trade-up” campaign for the 360 elite packages. It basically raises the trade in value of the system when purchasing a 360 Elite. The one draw back is that Microsoft has decided to not include HD DVD support standard out of the box with the elite. The reasons behind this decision were that: a) HD DVD is not a proven next-gen format, and b) not including this function is keeping the price point lower than it would have been, if HD DVD support was included. These are 2 legitimate reasons I guess, but come on Microsoft we all know you are “the Bank” in this next gen console fight, splurge a little! Not only that, get up and support a format you intend to stand behind! Microsoft’s choice to stick with their “you choose when to go next Gen” strategy leaves a vulnerable point for Sony to exploit in my opinion. Especially with the BluRay format doing so well. Although this is nowhere near the end of the next-gen console war, The 360 has made an aggressive attempt at the crown again, early on in this fight.